I have been busy in the last few weeks. Here is an update of my happenings and posts. From March 8-11, I attended and presented at the third annual Lown Institute Conference in San Diego. I have never felt more at home in a conference than I did at the Lown conference. Take a look at the About Us page of the Lown Institute and you will see why. No matter how things turn out for me in Medicine–today or tomorrow–I am happy and proud to be on the same side as Dr. Bernard Lown and his Institute. The motto of the conference was RightCare. That is perfect. Here is a link to a front page story in the San Diego Union-Tribune on the meeting. Dr. David Martin (Electrophysiologist and Chair of Medicine at Lahey Clinic) and I presented on overuse and misuse of atrial fibrillation ablation. In that same breakout session, Dr David Brown (Professor of Cardiology at Washington University, St. Louis) and Dr. William Boden (Lead investigator of the Courage Trial, Chief of Medicine at the Samuel S. Stratton VA Medical Center and Vice-Chairman, Department of Medicine at Albany Medical College) presented on overuse and misuse of cardiac stents in patients with stable coronary artery disease. It’s interesting that the essence of wrong care in both AF and CAD is the overuse of focal strategies to treat systemic (widespread) disease. I sat next to Dr. Boden at dinner. It was fun to meet such an eminent figure in the field. There were many highlights of the Lown Conference. Dr. Harlan Krumholz (Yale University) gave an inspiring talk on ideas to improve healthcare. For instance: we could fix the atrocious informed consent process, we could make doctor-centric guidelines more patient-centric, and we should allow patients to own their medical records. He even mentioned my name to the crowd, in that we could frame medical decisions better by using the percent-same-result stat that I came up with when comparing new anticoagulant drugs to warfarin in this post. There is a lot to say about the 2015 American College of Cardiology Sessions, which followed the Lown conference in San Diego. First of all, I was faculty. I gave two invited lectures. One talk was on ICD decision-making and another was on lifelong learning. My wife Staci also presented. Her talk was on palliative care for the cardiologist. 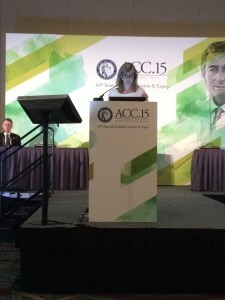 Seeing Dr. Staci at the podium of ACC gave me chills. It was very cool. This is my report on Staci’s talk. 15 Things All Cardiologists Should Know About Palliative Care. This Tweet went viral. It was a picture of a slide Staci showed on how to reduce pill burden in elderly patients. I also attended ACC as a writer for Medscape. In this role, I met and interviewed ACC keynote speaker, author and Stanford professor Dr. Abraham Verghese. His best-selling novel, Cutting for Stone, moved me to refocus more effort on the basics of doctoring–the history and physical exam. What a thrill it was to sit down with a real writer–a novelist–for Q and A. Stay tuned for the details of that interview. 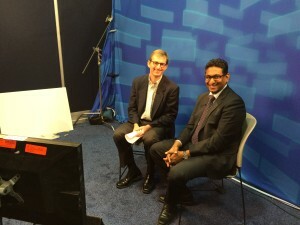 I also had the privilege to do a video interview with my friend Dr. Prash Sanders (Adelaide, Australia). We discussed his team’s late-breaking trial, Long-Term Effect of Goal Directed Weight Management on an Atrial Fibrillation Cohort (LEGACY), which showed the anti-arrhythmic power of weight loss for the disease atrial fibrillation. Dr. Valentine Fuster is the editor of the Journal of the American College of Cardiology and he is a leading voice in Cardiology. He called LEGACY the most important trial of ACC2015. So did Dr. Rich Fogel, the president of the Heart Rhythm Society. How Can We Afford Not to Pay Attention to LEGACY? Left Atrial Appendage Closure: Resist the Urge? 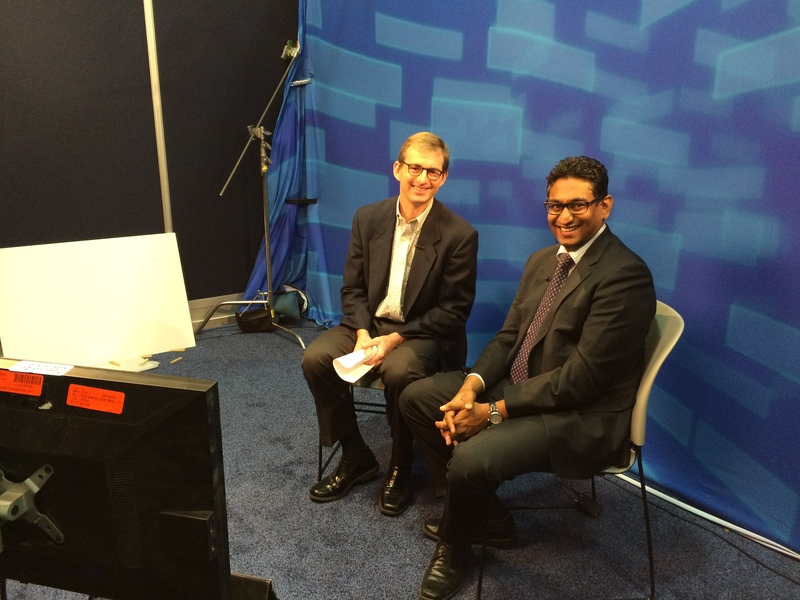 My colleagues at theHeart.org | Medscape Cardiology did a terrific job covering ACC2015. Here is the link to the ACC2015 summary page. I have followed your blog for a number of years and your growth as a critical intellect and spokesperson is nothing short of dazzling. 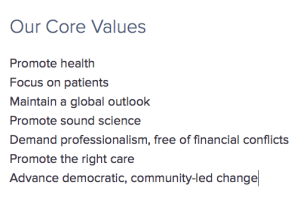 You are on course to be a Key Opinion Leader in the annals of 21st century medicine. Regarding the matter of medical overuse and misuse, I believe we have reached a tipping point of un-deniability. 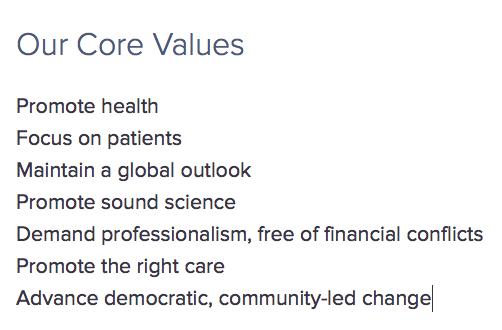 In other words, patient harm is now so pervasive that it is becoming broadly apparent at a grass roots level — which means that change will begin to happen from the bottom up. This conclusion brings me back to the final question about medical evidence that was asked by a family doctor at one of the Lown conference sessions: “Who are we to believe then?” Like you, I am delighted that one of the presenters responded that “a lot of real doctors write blogs.” That being said, I would add that the time has never been more right for us to start believing patients — the silenced majority, whose direct experience of harm has heretofore been dismissed, discounted, and downplayed to the detriment of us all. Then again, I’m sure your readership (lay people and professionals alike) would stand to benefit greatly from any other doctor’s blog you could recommend. Would you consider adding a BLOG ROLL to this website. Best to you and fellow travelers.